Finlayson HH (1961) Mitchell's wombat in South Australia. Transactions of the Royal Society of South Australia 85, 207-15. Mcllroy JC, Cooper RJ and Gifford EJ (1981). Inside the burrow of the common wombat, Vombatus ursinus (Shaw, 1800). Victorian Naturalist 98, 60-3. Nicholson PJ (1963) Wombats. Timbertop Magazine 8, 32-8. Shimmin GA, Skinner J and Baudinette RV (2002). 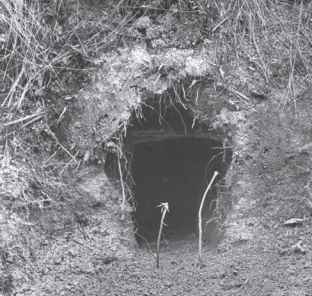 The burrow architecture and environment of the southern hairy-nosed wombat (Lasiorhinus latifrons). Journal of Zoology, London 258, 469-77. Steele VR and Temple-Smith PD (1998). Physical structure of warrens of a small colony of southern hairy-nosed wombats Lasiorhinus latifrons. In Wombats. (Eds RT Wells and PA Pridmore) pp. 113-24. Surrey Beatty and Sons, Chipping Norton. Troughton E (1941). Furred Animals of Australia. Angus and Robertson, Sydney.